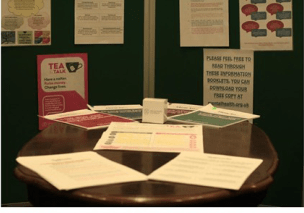 Huntercombe Hospital Stafford held a Tea and Talk afternoon for World Mental Health day, where patients and staff got together and have a natter whilst enjoying a good old cuppa. This gave patients from across the hospital a chance to mingle and interact with each other, they worked together to complete a quiz and sat reading through facts and fiction about mental health, they also completed a list of things they felt may reduce or improve a person’s mental health. There were also information booklets available on how to look after your mental health using exercise, how to look after your mental health using mindfulness and leaflets with information on where you can find help and support 24 hours a day if you or someone you know is suffering from a mental illness. All in all the afternoon was a success and we would like to continue to raise awareness about mental health and stamp out the stigma.